When a numerical grid is initially created ( see "Creating a Finite Difference Grid" section), the horizontal grid spacing is uniform. However, in many situations it is advantageous to have non-uniform grid spacing to allow for finer grid discretization in the areas of interest, and larger grid spacing in areas which are less important, or where less data is available. Visual MODFLOW Flex allows you to refine or coarsen areas of a numerical grid by adding or removing grid lines within a specified row/column interval. This process is described in the following section. You cannot edit a grid that contains a child grid (i.e. grid edits are not currently available for LGR Models). To edit the grid (rows and columns) select the View/Edit Grid step of the Numerical Workflow and then select the Edit grid button. Alternatively, you can find this option from the Model Explorer tree, right-click on the Numerical Grid, and select Edit Numerical Grid from the pop-up menu. 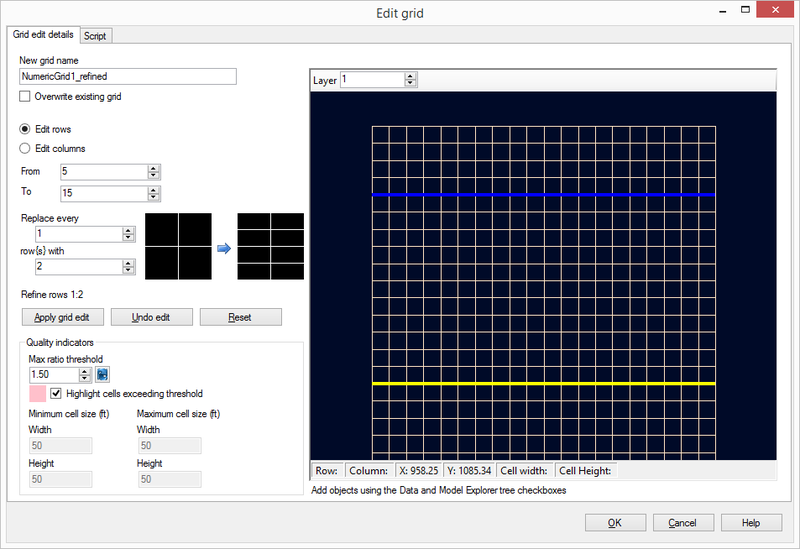 The Edit grid dialog provides options for refining/coarsening a numerical grid. When you edit the grid by default you are creating a new grid - and a default New grid name is generated (you can adjust this if you wish). If however, you prefer to simply overwrite your existing grid with the changes you make simply select the check box to do so. You can add data objects (e.g., boundary conditions, wells, site maps) from the data explorer to the 2D Viewer preview to assist you in determining the areas in which horizontal refinement/coarsening should be applied. Select the desired data objects from the Data Explorer, and the data will be displayed in the 2D Viewer preview. •Select the Edit Rows radio button to add/remove grid lines (rows) along the Y-direction of the numerical grid, or select the Edit columns radio button to add/remove grid lines (columns) along the X-direction of the numerical grid. •Specify the row/column interval for which the refinement/coarsening should be applied, by specifying the From row/column and the To row/column. For example, if you would like to refine the grid area between row 20 and 30, you would enter 20 as the From row and 30 as the To row. In the preview the blue line represents the From row/column while the yellow line represents the To row/column. •Next, specify the refinement/coarsening factor. In the example above we are going to Replace every 1 row with 2 - so the grid will be refined. This means that we would subdivide each row within the specified interval into two equally spaced rows. •Instead, if we changed the option to indicate we are going to Replace every 2 rows with 1 then the grid would be coarsened. This means we would reduce the number of rows within the specified interval by a factor of 2. •When you select the Apply grid edit button the preview will be updated with your edits. You also have options to Undo your edit - this will undo your last change. You can keep selecting Undo edit to undo more changes. Reset will return the preview to the original rows and columns. •Click the OK button to create the new refined/coarsened grid. You will find it in the Model Explorer. When editing a grid all inputs from the original grid (property zones, boundary conditions, pumping wells, observation wells, zone budget zones, and particles) will be reassigned as appropriate to the new edited grid. 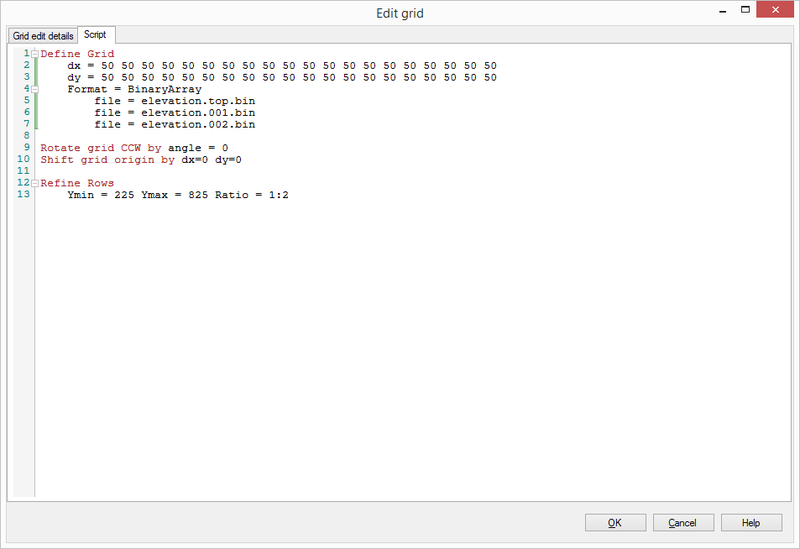 If the original grid has multiple runs associated with it - the inputs are taken from the first run. The quality indicators can help you find areas in your grid where you may wish to make adjustments. By default the Maximum ratio threshold is 1.5 however you can adjust this to your model requirements.If you do not wish to have the Quality indicators on simply uncheck the Highlight cells exceeding threshold option. 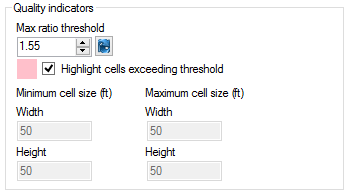 Also displayed in the Minimum and Maximum cell size. If preferred, you can make your grid edits by using the Script option. On this tab you will find the script for any edits you make on the Grid edit details tab allowing you to learn the script language.